Flight manuals and operating handbooks are concise reference books that provide specific information about a particular aircraft or subject. They contain basic facts, information, and/or instructions for the pilot about the operation of an aircraft, flying techniques, etc., and are intended to be kept on hand for ready reference. The aircraft owner/information manual is a document developed by the aircraft manufacturer and contains general information about the make and model of the aircraft. The manual is not approved by the Federal Aviation Administration (FAA) and is not specific to an individual aircraft. The manual provides general information about the operation of an aircraft, is not kept current, and cannot be substituted for the AFM/POH. An AFM is a document developed by the aircraft manufacturer and approved by the FAA. This book contains the information and instructions required to operate an aircraft safely. A pilot must comply with this information which is specific to a particular make and model of aircraft, usually by serial number. An AFM contains the operating procedures and limitations of that aircraft. Title 14 of the Code of Federal Regulations (14 CFR) part 91 requires that pilots comply with the operating limitations specified in the approved flight manuals, markings, and placards. Originally, flight manuals followed whatever format and content the manufacturer felt was appropriate, but this changed with the acceptance of Specification No. 1 prepared by the General Aviation Manufacturers Association (GAMA). Specification No. 1 established a standardized format for all general aviation airplane and helicopter flight manuals. The POH is a document developed by the aircraft manufacturer and contains FAA-approved AFM information. If “POH” is used in the main title, a statement must be included on the title page indicating that sections of the document are FAA approved as the AFM. The POH for most light aircraft built after 1975 is also designated as the FAA-approved flight manual. The typical AFM/POH contains the following nine sections: General; Limitations; Emergency Procedures; Normal Procedures; Performance; Weight and Balance/Equipment List; Systems Description; Handling, Service, and Maintenance; and Supplements. Manufacturers also have the option of including additional sections, such as one on Safety and Operational Tips or an alphabetical index at the end of the POH. While the AFM/POH may appear similar for the same make and model of aircraft, each manual is unique and contains specific information about a particular aircraft, such as the equipment installed and weight and balance information. Manufacturers are required to include the serial number and registration on the title page to identify the aircraft to which the manual belongs. If a manual does not indicate a specific aircraft registration and serial number, it is limited to general study purposes only. Most manufacturers include a table of contents that identifies the order of the entire manual by section number and title. Usually, each section also contains a table of contents for that section. Page numbers reflect the section and page within that section (1-1, 1-2, 2-1, 3-1, etc.). If the manual is published in loose-leaf form, each section is usually marked with a divider tab indicating the section number, title, or both. The Emergency Procedures section may have a red tab for quick identification and reference. The General section provides the basic descriptive information on the airframe and powerplant(s). Some manuals include a three-dimensional drawing of the aircraft that provides dimensions of various components. Included are such items as wingspan, maximum height, overall length, wheelbase length, main landing gear track width, diameter of the rotor system, maximum propeller diameter, propeller ground clearance, minimum turning radius, and wing area. This section serves as a quick reference and helps a pilot become familiar with the aircraft. The last segment of the General section contains definitions, abbreviations, explanations of symbology, and some of the terminology used in the POH. At the discretion of the manufacturer, metric and other conversion tables may also be included. The Limitations section contains only those limitations required by regulation or that are necessary for the safe operation of the aircraft, powerplant, systems, and equipment. It includes operating limitations, instrument markings, color-coding, and basic placards. Some of the limitation areas are airspeed, powerplant, weight and loading distribution, and flight. 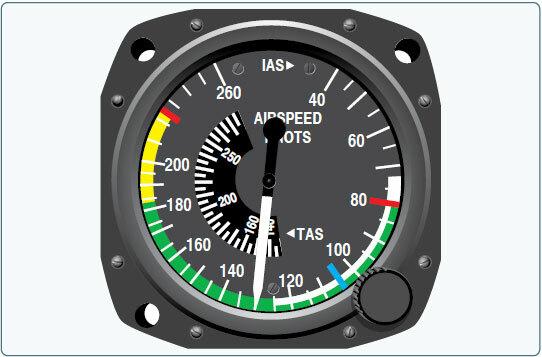 Airspeed limitations are shown on the airspeed indicator (ASI) by color coding and on placards or graphs in the aircraft. [Figure 9-1] A red line on the ASI shows the airspeed limit beyond which structural damage could occur. This is called the never-exceed speed (VNE). A yellow arc indicates the speed range between maximum structural cruising speed (VN0) and VNE. Operation of an aircraft in the yellow airspeed arc is for smooth air only and then only with caution. A green arc depicts the normal operating speed range, with the upper end at VN0 and the lower end at stalling speed at maximum weight with the landing gear and flaps retracted (VS1). For airplanes, the flap operating range is depicted by the white arc, with the upper end at the maximum flap extended speed (VFE), and the lower end at the stalling speed with the landing gear and flaps in the landing configuration (VS0). Figure 9-1. Single-engine airspeed indicator. Figure 9-2. Multi-engine airspeed indicator. Figure 9-3. 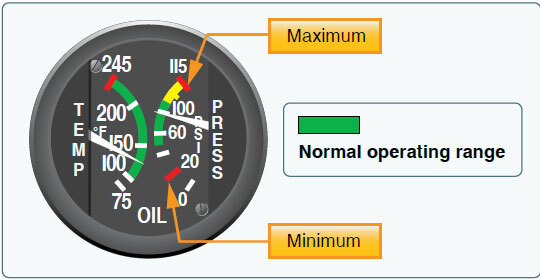 Minimum, maximum, and normal operating range markings on oil gauge. All reciprocating-engine powered aircraft must have a revolutions per minute (rpm) indicator for each engine. 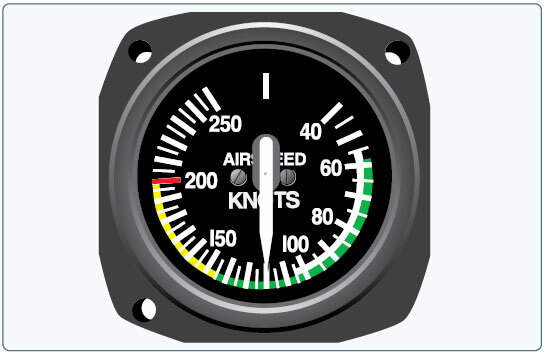 Aircraft equipped with a constant-speed propeller or rotor system use a manifold pressure gauge to monitor power output and a tachometer to monitor propeller or rotor speed. Both instruments depict the maximum operating limit with a red radial line and the normal operating range with a green arc. [Figure 9-4] Some instruments may have a yellow arc to indicate a caution area. Figure 9-4. 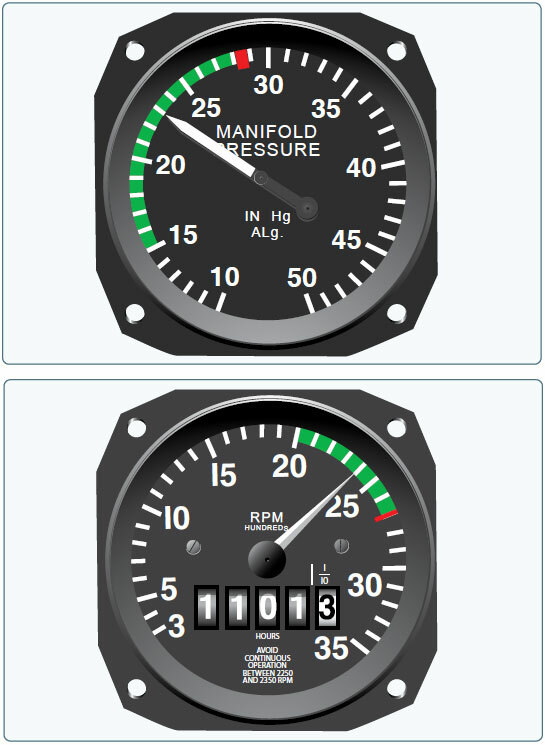 Manifold pressure gauge (top) and tachometer (bottom). Weight and Loading Distribution contains the maximum certificated weights, as well as the center of gravity (CG) range. The location of the reference datum used in balance computations is included in this section. Weight and balance computations are not provided in this area, but rather in the weight and balance section of the AFM/POH. Flight Limits list authorized maneuvers with appropriate entry speeds, flight load factor limits, and types of operation limits. It also indicates those maneuvers that are prohibited, such as spins or acrobatic flight, as well as operational limitations such as flight into known icing conditions. Most aircraft display one or more placards that contain information having a direct bearing on the safe operation of the aircraft. 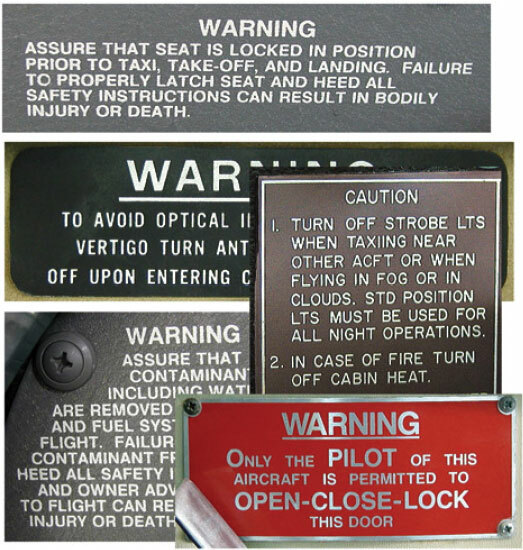 These placards are located in conspicuous places and are reproduced in the Limitations section or as directed by an Airworthiness Directive (AD). [Figure 9-5] Airworthiness Directives are explained in detail later in this category. Figure 9-5. Placards are used to depict aircraft limitations.